We've seen some zany collector's editions in our day, but I think this one might take the cake. 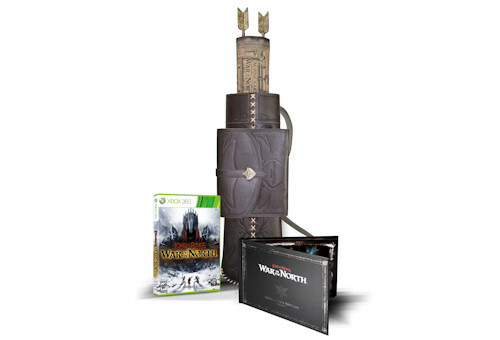 The Lord of the Rings: War in the North collector's edition comes with a leather quiver case for the game. It's a quiver for arrows, it's a case for the game, and you can wear it on your back while you play and shout "FOR FRODO" as you charge into the battles against Sauron. Here's what your $129.99 gets you. War in the North Theme Pack (PS3 sku) - includes War in the North wallpaper, fonts, icons and much more! There's also a host of retailer exclusive goodies for the game which reveal some of the upcoming DLC which includes challenge maps. One final bit. The press release for this mentions the game is a "Fall release" - while we previously had it pegged for late August, it looks like this may have unofficially announced a delay.